The results of the 2017 IUCN World Heritage Outlook indicate that for 64% of all sites (154) the conservation outlook is either good or good with some concerns, while for 29% of sites (70) the outlook is of significant concern, and for 7% of sites (17) it is assessed as critical. These results are for the 241 natural World Heritage sites listed as of November 2017, including new sites which have been inscribed on the World Heritage List since the 2014 report. When comparing results only for sites where two assessments can be made, fewer sites are assessed as having a good conservation outlook (43 sites in 2017 compared to 47 in 2014). A more positive finding is the reduction in the number of sites assessed as critical (17 in 2017 compared to 19 in 2014). 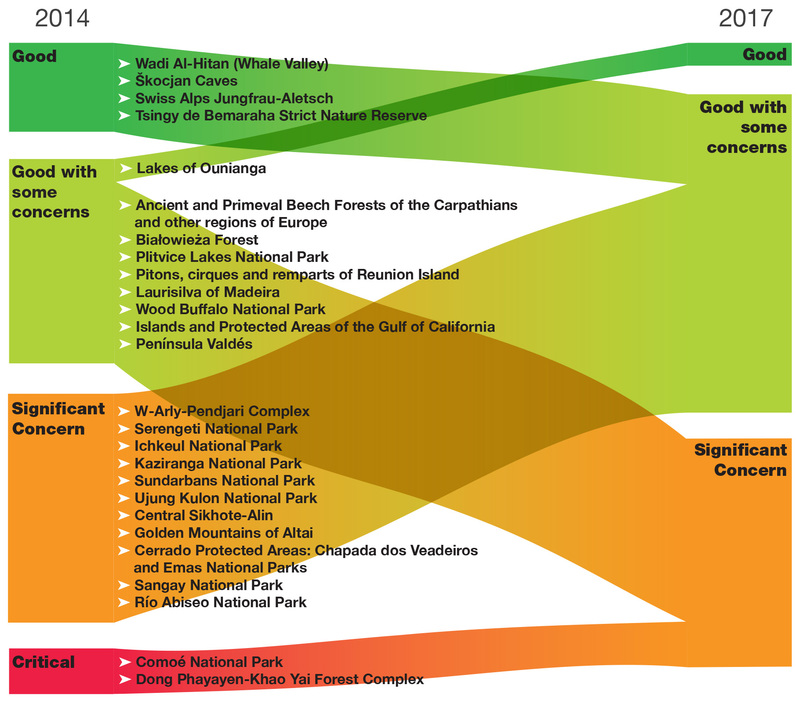 The conservation outlook of 26 sites changed between 2014 and 2017: 14 improving and 12 deteriorating. The biggest change occurred in Europe, where the conservation outlook improved for two sites, but deteriorated for seven. Only positive changes were recorded in Asia, with four sites improving, while in Africa changes were mainly positive with four sites demonstrating an improved conservation outlook. Two sites succeeded in moving out of a critical outlook since 2014. The IUCN World Heritage Outlook assesses both current and potential threats. 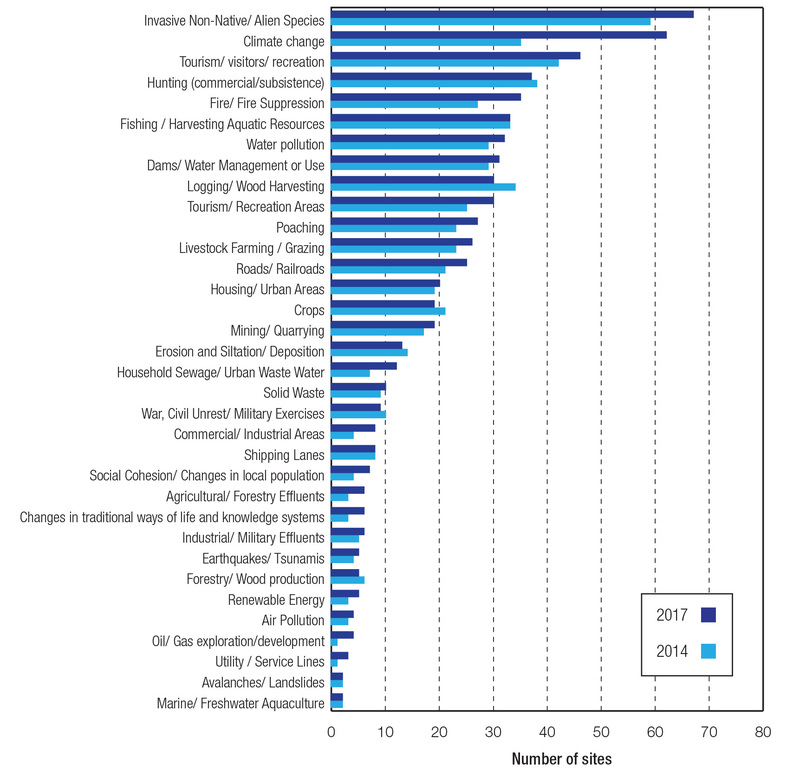 The 2017 results show that almost all categories of threats are occurring in an increasing number of natural World Heritage sites compared to 2014. Invasive species, climate change and tourism impacts are assessed, in that order, as the three most significant current threats to natural World Heritage. 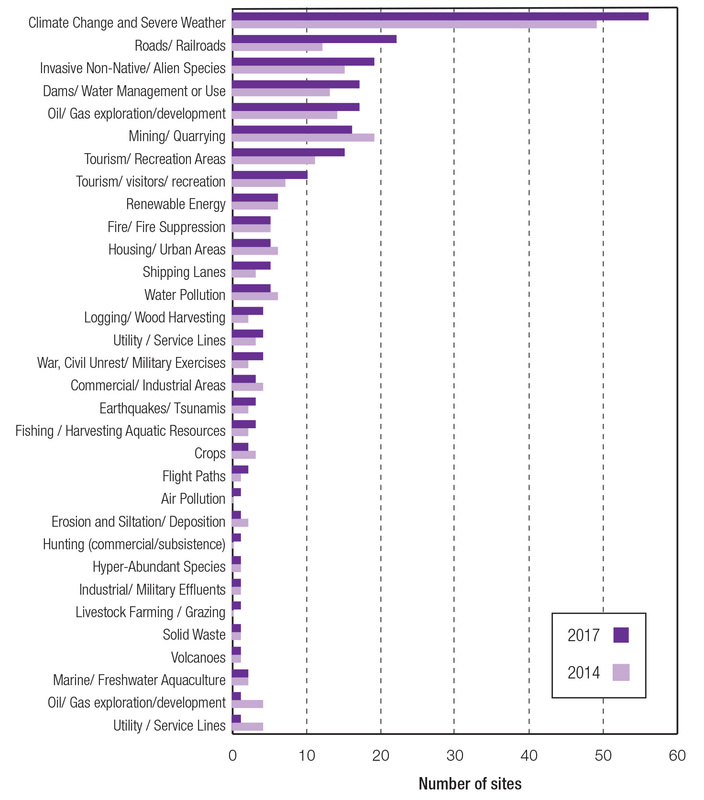 Climate change is the fastest growing threat, with a 77% increase in sites where it is seen as a high or a very high threat (62 sites in 2017, compared to 35 in 2014). It also remains by far the largest potential threat. Pressure from planned infrastructure is also increasing, as major development including roads, dams, tourism facilities, mining and oil and gas projects are among the top potential threats. The overall effectiveness of protection and management of natural World Heritage sites has decreased since 2014. The percentage of sites where protection and management are assessed as overall “effective” or “highly effective” has declined from 54% in 2014 to 48% in 2017, when comparing the 228 sites for which two assessments are available. This combination of increasing threats and less effective protection and management presents a clear risk to the World Heritage values of the sites, and calls for greater attention to protect these world class sites. In order for natural World Heritage sites to be able to respond to threats, investing in protection and management is key. The 14 sites which have moved towards an improved outlook show that positive outcomes are possible where sustained efforts are made to address challenges. It is important to do more to prioritise efforts, at national and international levels, to help the most threatened sites move from a critical outlook. Many sites show areas of improved performance and, even if in some cases this has not been enough to trigger a change in the overall outlook rating, they still provide examples of good practice. Conversely, sites with a positive outlook should not be considered impervious to pressures and continued vigilance is required to guarantee their outlook remains positive. As threats to natural World Heritage sites are intensifying, it will be even more important to ensure that the positive results from sites with an improved outlook are shared, as a means to inspire the highest levels of conservation success that are expected from World Heritage status.